Too hot to cook? This Quinoa, Pepper and Cannellini Bean Salad is almost a no-cook recipe. You do have to cook the quinoa, but it has to cool down before it’s mixed with the other ingredients. You can cook the quinoa early in the day before your house heats up and assemble the salad later. The recipe is adapted from one in Rena Patten’s Cooking with Quinoa and it is quite easy to make. It would be a great “meatless Monday” offering, but I served it last night with a grilled hanger steak. It was a fine meal for a hot summer night. 1. Bring the 1½ cups of water to a boil in a large saucepan. Add the 1/4 teaspoon of salt and the quinoa. Bring to a boil, reduce heat to medium low, cover and simmer for about 12 minutes, until the water is absorbed and you can see the little quinoa “tails”. Remove the pan from the heat. Fluff with a fork and let it cool off. 2. Whisk the olive oil, lemon juice and mustard together in a small bowl. Press the clove of garlic into the dressing. Whisk again. Season with a bit of salt and pepper. 3. 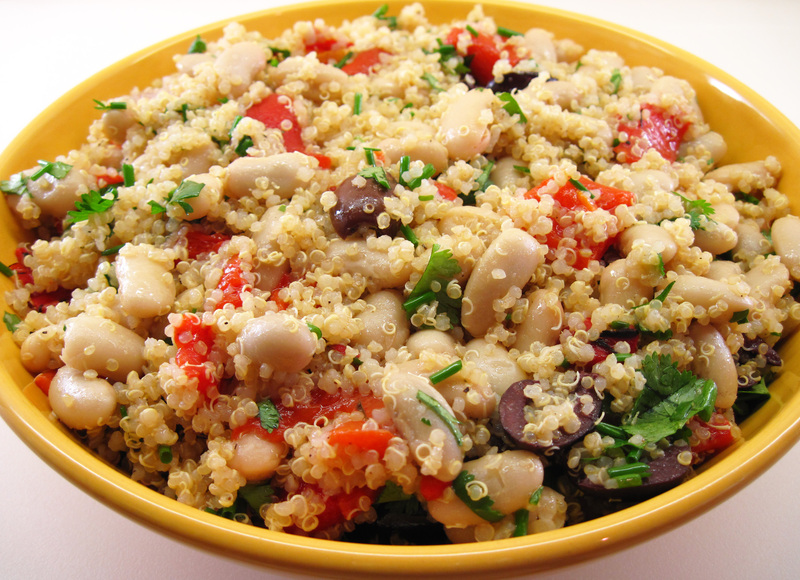 Put the quinoa, beans, peppers, parsley, chives, and black olives in a large bowl. Pour the dressing over the salad and stir so it is well distributed. Taste and season with salt and pepper, if necessary. I do love me some quinoa! So yummy! Just the kind of thing I love to make in these dog days of summer. Light, quick and tasty. What more could you ask for? This looks delicious. Thanks for stopping by. Have a wonderful weekend! !